My good friend Aleesha always used to say that the concept of ‘home’ can be fluid. She used to say ‘home is where you rest your head’. And thankfully, finding a place to rest my head in Bangkok has proved to be a pretty good experience. Either that, or I am getting better at researching and choosing the good from the bad! 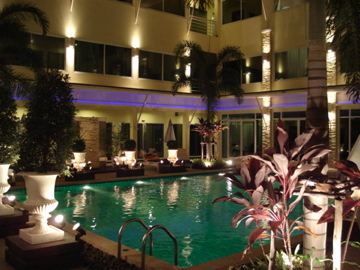 We spent our first night in Bangkok at the lovely Imm Fusion boutique hotel, close to the On Nut train station. The hotel was right across the road from a fantastic night time food court with dozens of stalls selling everything from dumplings to German sausages to oyster omelettes to spicy papaya salad. 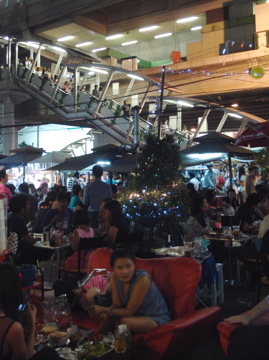 It was a great atmosphere, with locals and foreigners sitting at small wooden tables, enjoying the cold beer and the live music from a Thai acoustic band that for some reason played ‘Puff The Magic Dragon’ twice’. Weird. The next day was spent house hunting, which was an interesting experience. The first place we went to check out turned out to be in a terrible location, right across the road from a huge construction site putting up a new skyrise, and facing a huge highway. We didn’t even bother to go inside. The next place was much too far from the train station, and a bit too isolated and inconvenient. We then went to Phrom Pong station to have a sushi lunch and look around there too. Phrom Pong is Bangkok’s ‘Little Tokyo’, with endless Japanese food and even maid cafes. The sushi was decent, but the area was much too busy, noisy and crowded. We decided to get the hell out of downtown. We headed back to the On Nut area, and decided that since we quite liked the vibe of On Nut anyways, we should just do some footwork and see what was available in the area. We walked from the station and turned onto some of the side streets to pop in to a few places. Some were good, some were pretty bad. One wanted three months rent in advance, along with the monthly rent, and considering we are only staying for three months, it was doubtful whether we would get our deposit back. Eventually we decided on a lovely little serviced apartment called The Green Bells, a place we stumbled upon late last night and decided to see on a whim. Turned out to be about 50% Japanese residents, with the staff all speaking both English and Japanese. It has a nice bedroom, a lovely pool, a laundry room, and excellent service. They provide sheets, towels, and a cleaning service, along with WiFi and cable. We moved in this morning, and have settled in nicely. It’s also nice to be practicing Japanese again! The great thing about Bangkok is that it is so foreigner friendly. Thailand has such a huge tourism industry, there is no shortage of hotels, serviced apartments, and places for rent, so all you have to do is show up. A lot of people here speak English, and the transport system is excellent. Best of all, with an exchange rate of USD 1 to THB 30, everything is not only affordable, but usually really cheap. Only one thing is a pain in the royal rass — Thailand’s law about selling alcohol between the hours of 2-5 pm. Apparently a lot of school kids were buying and abusing booze after school, or sending adults to buy them booze, so you are not allowed to buy alcohol in the supermarkets or convenience stores until after 5 pm. After we settled in to our new place and did laundry and unpacked, all I wanted was a cold beer. But the big grocery store said they could not sell it to me. I came back here to Green Bells to ask them, and the receptionist here leaned in, and conspiratorially whispered in my ear that a tiny little shop down the road sold booze 24 hours a day, regardless of the law. I quickly popped out and picked up some Heinekens. Ahhhhh. The perfect end to a productive day. We’re thinking of you both. Keep recording your adventures. Thanks Eileen — Seiji is especially happy with the location as it has so much food around! The way to a man’s heart…. right?